Keith, the West Covina Fashion Plaza (aka Westfield West Covina) has the same design, and they added a wing as well that is in a neat position. I was just at this mall last weekend, and Gottschalk's inside has a lot of old design left from the May Company store. They didnt remodel it much when they moved it, definitely something to see. Its like going back to a department store in the 1960's with today's clothes. Holy cow, what was it, Christmas or something? That lot is PACKED. This is a great exterior shot. I wish more postcards showed views like this. I think every department store in the USA has become Macys. No, it does get like that during busy weekends. The parking lot at this time was really small. Later, it was extended to the south (of May Co) and a movie theatre was in the parking lot. That theatre since closed and torn down for more parking, and a parking structure was added when the Robinson-May wing opened. Very sad that The Broadway is to be demolished. I was there not too long ago (summer 2006) when the store was still open. It had been converted to Macy's but was like a time-warp back to the days of The Broadway. The interior literly had not been touched: Dark wood floors, large circular flourescent lighting, etc. It was such a great experience I can't put it in to words! The floor-plan was identical to the long demolished (1996) Broadway store at what was then the Orange Mall. What could be better than going back in time to visit old department stores! I returned a few months later and the beautiful store was closed as Macy's moved to the more modern May property. It's sad that business has no sense of nostalga! My first experience going to the May Company store in the Inland Center is like total bliss. We'd buy some clothes there, and we even bought an RCA TV on the second level of that place. It was in '87. OK, what baffled me about May Co. back in the late 80's was that the lower level was VERY empty, like a haunted floor. I snuck down there, and saw...NOTHING! 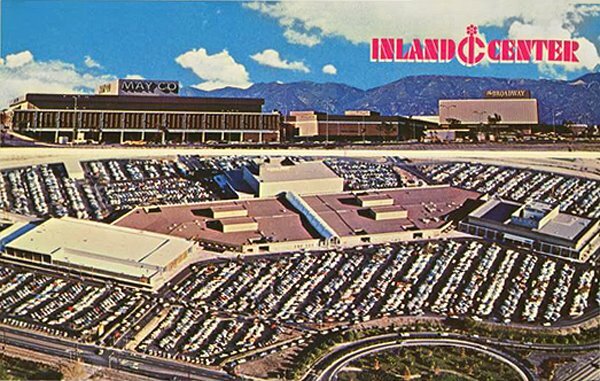 I always wandered what May Co. was selling in the lower level of the 60's and 70's. Anybody knows why it was empty in the 80's, I like to know. Also, it amazed me when Gottschalks took over the May Co. turf years ago, I'm amazed that Gottschalks had the guts to make the lower level happening and living again. Now Gottschalks sold furniture and other clothes in the lower level...but the sealed off the way to the lower level of the mall itself. In speaking of the lower lever part, I remember having the Flipper Flapper Arcade place, a Big 5 store, and a way to May Co. in the 80's. But the officials at the IC decided to make the lower level into some employee office until years later, they sealed off the entire lower level! Unfortunate for me, cause I would've like to see what the lower level looked like now. Anyway, this IC place will still be the happening place to me. "OK, what baffled me about May Co. back in the late 80's was that the lower level was VERY empty, like a haunted floor. I snuck down there, and saw...NOTHING! 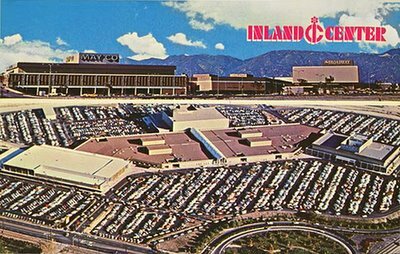 I always wandered what May Co. was selling in the lower level of the 60's and 70's. Anybody knows why it was empty in the 80's, I like to know." The lower level of May Company used to contain many departments, such as the gift wrap department, travel agency (Both located to the left and right respectively of the lower floor entrance) along with: Ladies nighties, children's clothing, art supplies, linens, toys and Luggage. When The May Company began phasing out departments, like all big retailers were doing in the 80's, The need for a 3rd floor became moot. therefore it became the store's wherehouse and was closed to the public in the mid to late 80's. When Gottchalk's reopened the store they redid the whole bottom floor and brought back alot of what used to be there, including toys and children's clothes. But, as times changed, they phased out or moved departments and now it has become a bargain Basement. Did you know that May Company also had its own caffeteria? The Mall may have had Wyatt's but May Co had the Valenica Room, and up til the early 2000's it was still the same inside, long after the caffeteria had been shuttered.....they used to have traffic school in there along with it being the employee break area, which it now is remodled into. The top floor along with the elevator remain virtually unchanged as they were when the mall opened in 1966. The lower floor of the ICM was at one time a Newberry's ,the Flipper Flapper, Oshman's and the home of KGGI, a local radio station. But as time wore on, it too suffered and was closed when tenants moved out. I spent many afternoons in this mall and it was a big part of my childhood. As I grew it was also a part of my young Adult life( The Broadway was my first charge card) But as time and tastes have changed, so has the mall, and I frankly don't go much anymore...because there is nothing to go do there for me. P.S. for all you Labelscar folks, there is a labelscar for May Co. on the Mall entranced to Gottchalk's. Just look to the left and right of the respective entrances and you will see it, although faint, they both read "May Co". If you have any more questions, ask and I will seeif I can answer them. Thanks for the background info on the lower level. I also remember in the 80's that the B. Dalton Bookseller store is located near the May Company/Gottschalks main floor entrance, the food court (Including Sbarro) near the May Company/Gottschalks side entry way, Florsheim Shoes near the Broadway, Kay Bee Toys at the May Co. court, and near the elevator to the lower level, there was at one time in the late 80's a Nintendo play station where anyone can get demos of the games before buying them. I miss that station, they should do the same for Sony, Microsoft, among others. I've gotten some new info that the old Broadway territory is not going to be demolished, and Forever 21 (The clothing store) has claimed the Broadway's turf for quite some time. As for Gottschalks being bankrupt, the May Company/Gottschalks territory is now vacant. Nice picture. But the old Broadway is now Forever 21. The May CO/Gottshalcks building is vacant. Sears is still Sears and The added building which was Robinsons May is Macys. Wow i didnt know there was a movie theater. I've found some pics of today's ICM. This is from late 2009 when Gottschalks is very empty. Look at the labelscar at the very top. It's very visible. I also think the doors on the very far left is the Valencia Room. When it was May Company, it had two oval windows. What do you think of this sweet pic of Forever 21? They've gave an exterior design a change of pace, along with a paint job on the Broadway design. On the very top, they even added some bars to give it a modern look. Here's another pic of the some store. For all you purists and aficionados of The Broadway, here's Macy's in the 1990's. Hello guys, word has it is that October 2016, JCPenney will be where the old May Co/Gottschalks store was. I'm still looking for the blueprints to the ICM from 1966 to today, so if you found any, give me a comment.